I make a mixture of herbs, pepper, salt and balsamic vinegar. Peel a head of garlic. Using a sharp knife point from a paring or a boning knife make several slits in the top of the meat. 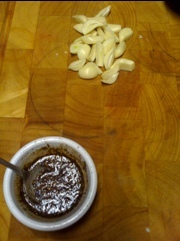 Tuck slivers or whole pieces of garlic into each slit. Coat with your spice/vinegar mixture, drizzle with a little olive oil. Notice I cook my roast in my cast iron frying pan, that way when I make gravy later it’s easy! Preheat oven to 450 degrees. 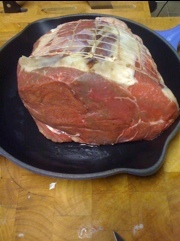 Calculate cooking time, using 20 minutes per pound of meat as a guide for a cross rib roast. Place roast in oven, TURN THE TEMPERATURE DOWN to 350 degrees and roast for the calculated time, checking with an instant meat thermometer after 3/4 of the cooking time just to make sure things are going ok. The thermometer should register about 140 (rare) to 155 degrees (medium). Remove from oven. Pull your roast from the oven and tent with foil for about 20 minutes so the meat can rest and the juices can re-absorb. Slice the meat and serve with mashed potatoes and gravy. This is seriously one of my death row foods, the leftovers are even still breathtaking! What did we (your readers) do that was so egregious as to warrant this punishment? To call this “teasing” is an understatement! 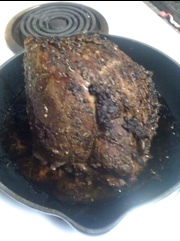 Oh sure, I post about the demise of our beef cattle, and you post the most incredible-looking roast I’ve ever seen! The vegetarians will not be happy. Yum – never again will I use a slow cooker to make a cross rib roast! 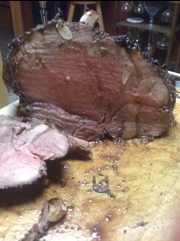 Hubby was impressed with color and texture of finished roast. I am delighted with the results! I cheated and used 2 tsp of Montreal Steak Seasoning instead of herbs and salt. Mixed that and pepper with the balsamic vinegar. 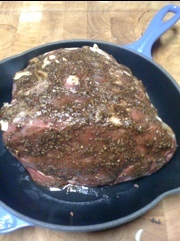 Used maybe a tablespoon of EVOO to rub in after rubbing the vinegar mix on the roast. 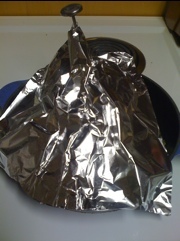 Don’t have a cast iron pan, but used boiling water in pan after removing roast to a hot platter and tenting with foil. Ended up with lots of lovely brown bits from the pan to make gravy using cornstarch instead of flour. Great rich flavor from the gravy. Made mashed potatoes and added horseradish to them for a bit of heat. Lots of leftovers and will slice thinly for sandwiches. Flavorful without the sodium of deli roast beef. Thank you!! Thank you for trying it!!!! I love Cross Rib Roasts! So good! I LOVE chuck roasts!!!! That is what I am having tonight! But cross rib roasts are my first favorite! I hope it turns out for you! Such a great roast beef recipe! I’ve made this several times and after enjoying it for dinners, have sliced it thinly and frozen it in several individual packages for sandwiches. A hubby approved recipe! Freezing is a good idea! I’ll have to try that! I cooked it to 125 F and then tented the roast for 20 minutes. Tender and rare…great tasting roast! lol. So allow me to reword this…. Thanks for the meal!! But yeah, thanks for spending time to discuss this topic here on your web site. I did this exactly the way intended. The most delicious meat ever.